316 S tainless Steel (0.9mm). 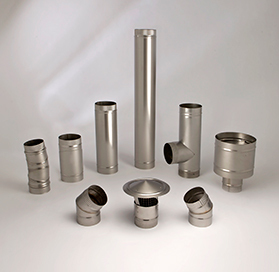 Push fit, stainless steel, single wall chimney for use on medium and high temperature solid and multifuel applications. Midtherm SW 316 is a range of prefabricated stainless steel single wall flue. 316 grade stainless steel 0.9mm product has a dull (2B) finish. SW 316 is used as a connecting flue pipe and for lining existing chimneys. NOTE: Adjustable Elbows included in range. Push fit socket and spigot type joint. Locking bands are available if required.